The B07CKSY8DK is the only Trustech dehumidifier we have on file. Tank capacity in ounces 41 oz. Dimensions (inches) 9.8(Width) x 12.8 (Height) x 6.5 (D)in. 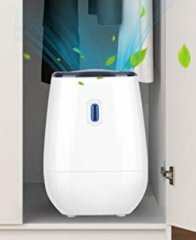 Also called Trustech 41oz Portable Quiet Dehumidifier.